4Links designs and manufactures a comprehensive range of SpaceWire test equipment. These provide unequalled insight into the operation of your SpaceWire network. Whether you are monitoring SpaceWire traffic between two devices, or creating a device model to initiate or respond to another device, 4Links offers you the right solution, so you can quickly and efficiently find and diagnose your problem. By using TCP/IP over a Gigabit Ethernet network you can locally or remotely connect to the test equipment, without the need to install additional cabling or requiring special device drivers on your computer. The design of the test equipment ensures your flight equipment is protected from possible damage. Please talk to 4Links for details of how this is achieved. These are products that can generate or respond to SpaceWire packets. They are controlled over TCP/IP from a host computer and have a C or JAVA API allowing the control of data. Plugins like RMAP enable a simplified method of sending or receiving RMAP transactions. The user is able using the API to customise the traffic and create 0models of their devices (such as cameras, GPS, etc). These are products that monitor the data traffic in both directions between two SpaceWire devices. They can log and then post process the traffic data for analysis. Combined with continually monitoring for error conditions and generate real-time triggers to other test equipment makes them the perfect solution for passive monitoring and debugging of SpaceWire. The logging of data is performed over the Ethernet interface to the computer running the control software and stored on its storage device, giving the ability to support long data recordings over many days. These products enable other products to interact with one another and to other 3rd party products. The Absolute Time Interface is used to relay an IRIG-B time source to the test equipment enabling consistent time-tags. Other products in this range include cables and loopback connectors. 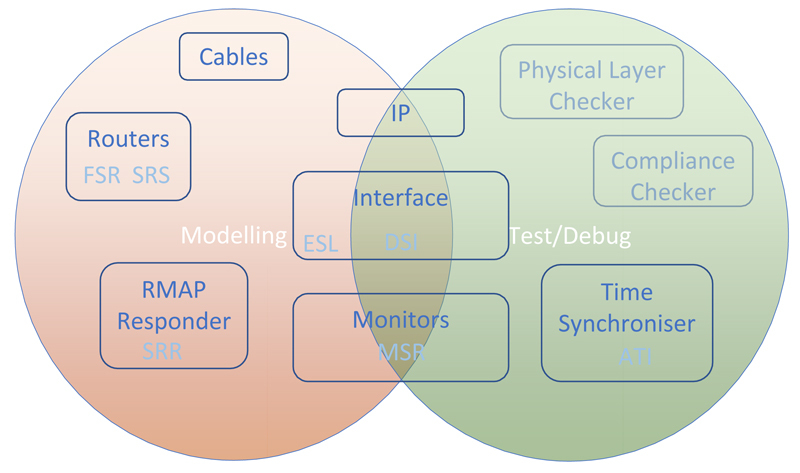 4Links offers a range of SpaceWire modelling solutions covering transaction initiators/responders, router switches and RMAP responders. 4Links’ SpaceWire IP is based on a version of the CoDec (Coder/Decoder) used in its test equipment for SpaceWire. Thousands of SpaceWire ports of this test equipment have proved to be interoperable with all the SpaceWire designs to which they have been connected. The IP is also flight proven as the fundamental interconnect on a satellite. The 4Links commercial cable assemblies for SpaceWire provide a lower-cost and flexible alternative to flight cables, when used for simulation and functional test of systems that are interconnected by SpaceWire. DSI 1U rackmount with gigabit Ethernet, 400Mbps, 2 ports used and 8 ports populated with maximum FPGA and SMA connectors at rear.